For hundreds of years, slate has been covering more American homes than any other material existed. Unmatched in practically every department, this classic roofing solution should be on top of your list. Slate can withstand the worst weathers without withering. From brutal snow to intense fire, heavy downpours to strong winds, slate can remain unscratched against harsh elements and extreme temperature changes. Your slate roofing system may shed a tile or two periodically. Nevertheless, a quick roof repair in Maryville, TN, will do the trick. In fact, it will take many years before it begins to happen. In any case, slate is sure to stay as stunning as it was in installation day. 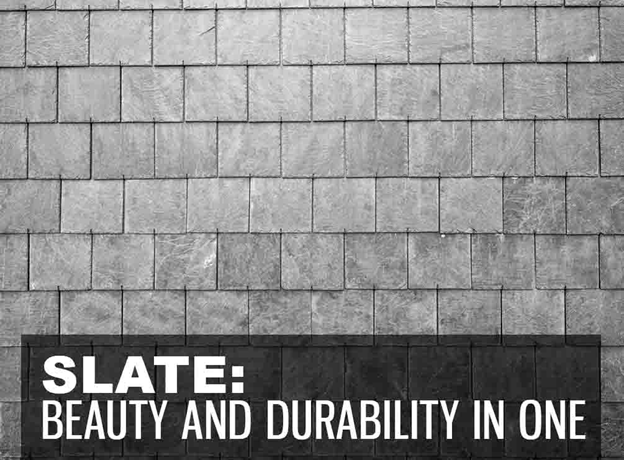 Slate tiles come in a wide range of natural colors, thicknesses, and sizes. No matter what your home’s architectural style, customization will be easy when you choose slate. Generally, the combination of different earthly hues is a popular pattern for slate roofs. From dark gray to purple, the pleasing mixture of nature’s colors would give your home its gorgeous covering. Your slate roof will certainly grow old with you, so choose a design that you’d love a lifetime. As a top roofing company in Maryville, TN, we know that slate is a sustainable roof material. It’s 100% natural, endures nature’s onslaughts, and lives for over a century. This makes slate the ultimate choice of the eco-conscious. Let Innovative Roofing and Siding help you find out if slate roofing is suitable for your home. Call us now at (865) 444-6070, and let’s talk about your project.